Microsoft is expected to show off Office 15, the next version of the company's productivity suite, on Monday at an event in San Francisco, according to numerous reports. Office has been available to a select group of users in a technical preview since January. It's not clear whether a public beta of Office might be available Monday, or whether it will arrive later this summer. Few details have seeped out about Office 15. Several reports claim Windows XP and Windows Vista won't be able to run Office 15. Microsoft is scheduled to stop supporting XP in 2014 and Vista support is expected to run out in 2017. If XP and Vista won't run the new Office, that leaves only Windows 7 and 8 PCs to run Microsoft's newest productivity suite. Of course, rumors persist that Microsoft will bring Office to the iPad with native Word, Excel, and PowerPoint apps. Microsoft in late 2011 released OneNote for the iPad. Nor has Microsoft said whether it will offer a touch-only Metro version of Office on Windows 8, the next version of the operating system, scheduled for release in October. 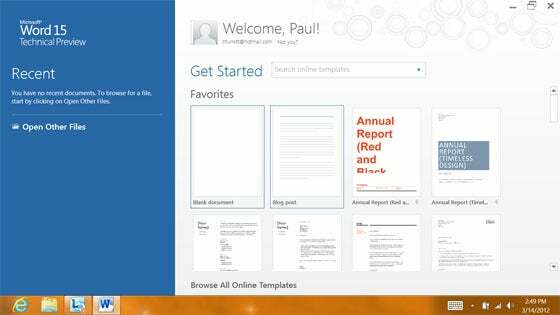 So far, only desktop UI versions of Office 15 have surfaced online. Microsoft is building Office 15 into Windows RT (the version of Windows 8 for ARM slates), but it too will feature the desktop versions. Based on leaks from the Technical Preview, it appears Metro, the main design language for Windows 8 and Windows Phone, will figure prominently in the look and feel of Office 15. This includes bold, basic colors, and square edges. Office's famous Ribbon UI will reportedly be hidden by default, giving Office 15 a more stripped-down and basic look. The new version of Office will also feature integration with cloud services such as Facebook, Flickr, Hotmail, and SkyDrive. Microsoft is reportedly preparing an Office Marketplace for extensions and tools, and Office 15 will also feature a touch-optimized mode for tablets and all-in-one touchscreens. In January, PJ Hough, vice president of development for Office, called Office 15 "the most ambitious undertaking yet for the Office Division."